Packaging Design Options :	You may select one of the 5 Package Design Options; "Stock" will be used if Packaging Design is not specified. 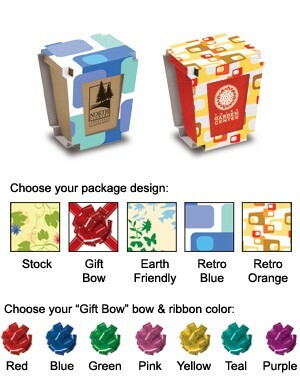 Choose from: Stock, Gift Bow (with your choice of bow color), Earth Friendly, Retro Blue or Retro Orange. Instructions are printed on the back panel of packaging. CUSTOM Package Design: Client submitted art on our template (see "Download Template"); no charge. AAkron custom design; $45.00 (G), includes a free e-proof. Pricing Includes :	a one-color silk-screened imprint on one side of each pot (all pots to have same imprint) & standard packaging ("Stock" will be used if Packaging Design is not specified). Promo Planter Color & Seed Packet Options :	You may select any of the 5 Planter colors, or choose an assortment. Choose from 8 Seed Packet Options... Flowers: Forget-Me-Nots, Pansies, Impatiens, Poppies. Herbs: Basil, Chives, Parsley, Thyme. Shipping Weight :	Approx. 12 lbs. per 100 pcs.